Whether you are in need of a watch cleaning service, watch battery replacement, stem and crown replacement, watch crystal replacement, or any other service, our repair center offers precision quality work, uses only genuine parts, and takes great pride in professionalism and personalized watch repair services. Almost All Brand Name Watches Repaired Manford’s Watch Repair values our customers. We want you to feel 100% confident that when you drop off your watch to us for repair and service that your are getting the most personalized and honest service available. One advantage to dropping off your watch to Manford’s Watch Repair is that you will be dealing directly with us, the repair facility. When you take your watch to your local jeweler, nine times out of ten, they are going to outsource your watch to a place like us. By dealing directly with the repair facility you are going to "cut out the middle man" and save money. The end result is, better communication, piece of mind knowing where your watch is, and the satisfaction of knowing that a professional is actually repairing it. 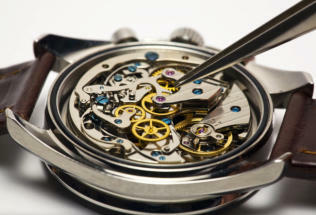 We understand and value the watch repair needs of our customers. We want you to feel 100% confident that when you drop off your watch for repair service that you are getting the most personalized and quality service available. If you have any questions on a watch in need of repair or service, simply call us and we will work with you over the phone to give you an estimate. Whether you are in need of a watch cleaning service, watch battery replacement, stem and crown replacement, watch crystal replacement, or any other service, our repair center offers precision quality work, uses only genuine parts, and takes great pride in professionalism and personalized watch restoration and watch repair services. Almost All Brand Name Watches Repaired Manford’s Watch Repair values our customers. We want you to feel 100% confident that when you drop off your watch to us for repair and service that your are getting the most personalized and honest service available. One advantage to dropping off your watch to Manford’s Watch Repair is that you will be dealing directly with us, the repair facility. When you take your watch to your local jeweler, nine times out of ten, they are going to outsource your watch to a place like us. By dealing directly with the repair facility you are going to "cut out the middle man" and save money. 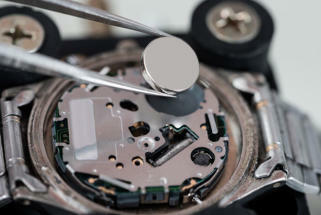 The end result is, better communication, piece of mind knowing where your watch is, and the satisfaction of knowing that a professional is actually repairing it. We understand and value the watch repair needs of our customers. We want you to feel 100% confident that when you drop off your watch for repair service that you are getting the most personalized and quality service available. If you have any questions on a watch in need of repair or service, simply call us and we will work with you over the phone to give you an estimate.